The City of Melbourne Engineering Services and Planning continue to demonstrate their incometance. Engineering Services Manager, Geoff Robinson, recommended that car parking provisions be waived for the development, A proposal that was overturned by the elected council, There is barley a car park free in the area as it is, let alone the ability to meet demand imposed by the new development. Surveys undertaken by residents on a Friday night showed their was 7 car parking spots available on Birwood Avenue some 3-400 meters from the Domain site. How Engineering Services came up with this recommendation is anyone’s guess. The recommendation by Engineering Services to waive car parking influenced the VCAT determination. Questions are being asked about the integrity of the City’s Engineering Services branch. Adding to residents s the recent changes to teh Planning Scheme that re-classified the Domain Road precinct from Business one zone to Commercial one Zone. Under the new Zone a licenced premises does not need a planning permit for its use. Geoff Lawler, Director of Planning was oblivious to the impact of the changes until questions were raised by residents. It has been proven that the changes are having a negative impact as VCAT decision granting a planning was based on the new planning zone changes undermines the objectives of the Melbourne Planning Scheme. The maximum noise level as measured from the center of the external court and balconies can not be allowed to exceed 3Db nor will the be allowed to serve drinks on the footpath no restaurant or cafe could remain viable under these conditions let alone command such a high rent. The owner will without doubt be back seeking a review and remove of these constrictions. But this time they will not be incumbered with issues of use and planning thanks to the State Governments planning scheme revisions and the failure of the City of Melbourne to object to the reclassification of this precinct to Commercial one zone. Lord Mayor, Robert Doyle, desperate to hang on to his power base threatened violence by stating he would violently oppose the move. Jeff Kennett former,Victorian Premier 1992 to 1999 who Robert Doyle as the State member for Malvern served under, would not be drawn into outlining boundaries said the City of Melbourne should be bigger. 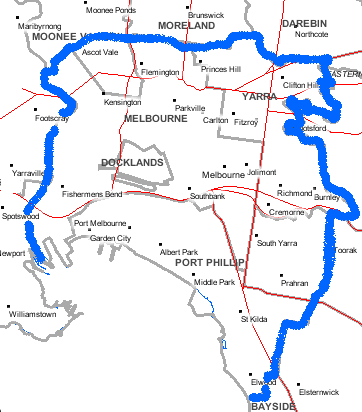 Jeff Kennett was responsible for the reduction in the size of the City of Melbourne back in 1993 when the City lost a sizable part of its former boundaries to the North. Mergers of other inner city coucnils took place leaving Melbourne a small shell of what it should be. There have been many pushes and recommendations for a Greater Melbourne which would put the City on par with cities such as London and Brisbane. Melbourne should as a minimum take in the City of Port Philip and the former City of Prahran to the South of the Yarra with the possibility of including the City of Yarra to the North East. Robert Doyle lives in the neigbouring City of Port Phillip and served as the Member of Malvern before losing the leadership of the State Parliamentary Liberal Party to Denis Napthine. He later resigned from State Parliament and stood for the City of Melbourne Lord Mayor’s Office in 2008 and again in 2012. He has served since in a lack luster sugar coated local government position milking his status as Lord Mayor of the Borough of Melbourne socializing with the likes of Boris Johnston Mayor of the Greater City of London. Doyle, who campaigned on a short lived “No Junkets” policy is desperate to cling on to the perks of office, International travel and the Lord Mayors Limousine . Melbourne must slash its local councils from 31 to just one if it is to plan services and large-scale infrastructure effectively, a former CEO of the City of Melbourne and aide to premier Jeff Kennett says. And Australia should cut its levels of government to just two – national and regional – rather than the current three tiers. ”Our federation and the sheer number and layers of organisations that involve themselves in decision making … slows us down,” said Elizabeth Proust delivering the Planning Institute’s annual Kemsley Oration, the industry’s key annual address, late last year. Mr Kennett on Thursday did not support Ms Proust’s call for one Melbourne council, but backed a dramatic expansion of Melbourne City Council’s boundaries. ”I think it would be a natural reform for the future,” Mr Kennett said, although he said he ”would not stipulate … how many neighbouring councils [Melbourne] should absorb”. He said council amalgamations by his government in 1994 were ”the right thing to do”, and it would be worth reviewing the numbers of councils. But Ms Proust said the amalgamations ”did not go far enough” as too many councils were ”too small to be effective or efficient”. Ms Proust was chief executive of the City of Melbourne from 1990 to 1995, and then secretary of the Department of Premier and Cabinet. During the tumultuous Kennett era, councils in Victoria were slashed from 210 to 79. ”That number is still too large,” she said. ”As is the number of 31 councils which cover Melbourne” because Melbourne’s size and scale demand city-wide vision and governance. Melbourne will grow from 4.25 million people to 6.5 million by 2050, according to the Napthine government strategy. Jude Munro, a former CEO of the Brisbane City Council, backed Ms Proust’s call. Brisbane is the country’s largest council, covering more than 1.1 million residents and running the city’s buses, ferries and its water infrastructure. Ms Munro headed Moreland Council and the old St Kilda Council in Melbourne in the 1990s. She said creating a greater Melbourne council made sense, but said the mayor would become ”a real competitor to the Premier of Victoria”. The Planning Institute’s Victorian president, Brett Davis, also cautioned that a merger of more councils was simplistic and might not address the city’s real governance challenges.